Despite a brief morning snow shower, a large group turned out Saturday morning for the Spc. Dustin J. Harris Memorial Mile walk/run in downtown Patten. 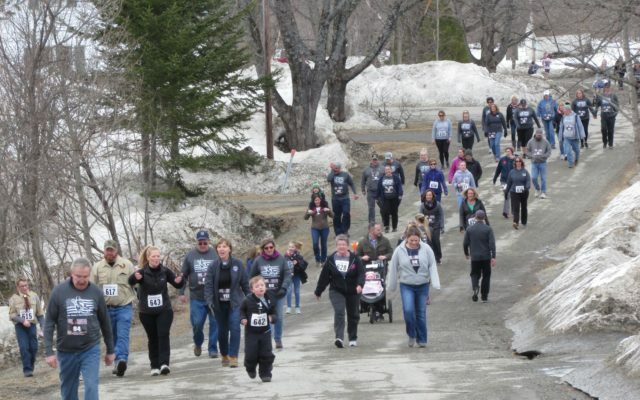 PATTEN, Maine — Despite a brief morning snow shower, a large group turned out Saturday morning for the Spc. Dustin J. Harris Memorial Mile walk/run in downtown Patten. In total, 202 participants, both in person and through “virtual walks elsewhere” raised over $3,500 for the Dustin J. Harris Memorial Scholarship and the Patten Main Street Flags project. Army Spc. 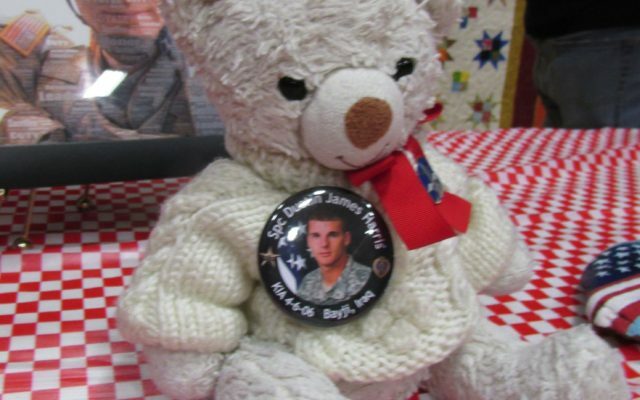 Harris was 21 years old when he died April 6, 2006, while serving in Bayji, Iraq, during Operation Iraqi Freedom. He was born May 11, 1984, in Millinocket, the son of Lorna and Scott Harris of Patten and graduated from Katahdin High School in June 2002. After graduation, he studied diesel and heavy mechanics at Eastern Maine Technical College in Bangor. He joined the U.S. Army in 2004 and trained as a paratrooper before being stationed in February 2005, with the 172nd Brigade Support Battalion at Fort Wainwright in Fairbanks, Alaska, according to information provided by the organizers. He deployed to Mosul, Iraq, in August 2005. Saturday’s event was held on the 13th anniversary of Harris’ death. Individual results were: Caleb Streinz, Hersey, 5:42.5; Luke Streinz, Hersey, 6:04.9; Mathew Savage, Patten, 6:09.7; Grady Ritchie, Sherman, 6:19.5; Abigail Streinz, Hersey, 6:23.0; Kaden McNally, Stacyville, 6:25.3; Hannah Streinz, Hersey, 6:34.6; Chris Streinz, Hersey, 6:42.8; Jon Pangburn, Eddington, 6:48.8; Justin Hurlbert, Patten, 6:54.0; Jeffery Martin, Patten, 6:55.1; Caleb Giles, Patten, 6:55.1; Kyle McNally, Sherman, 6:56.2; Jason McGlaughlin, Baring, 7:13.4; Jaime Pangburn, Eddington, 7:28.8; Jinger Pepin, Orrington, 7:29.1; Michael Savage, Sherman, 7:36.1; Michael Downing, Mount Chase, 7:37.6; J. Martin, Patten, 7:38.1; Natalea, Pepin, Orrington, 7:42.7; Emmalee Landry, Island Falls, 7:56.6; Rick Robinson, Bangor, 8:05.9; H. Hartsgrove, Patten, 8:08.4; Makayla Hartsgrove, Patten, 8:08.8; J. Pangburn, Eddington, 8:13.4; Brady Nason, Sherman, 8:14.8; and Wesley Richardson, Patten, 8:17.4. Also, Emily Robinson, Bangor, 8:25.3; A. MacFarline, Presque Isle, 8:40.4; A. Pelletier, Plymouth, 9:23.5; Pamela Savage, Sherman, 9:27.0; Philip Cullins, Plymouth, 9:29.0; Rhian Lafleur, Patten, 9:33.1; Tim Thoreson, Stacyville, 9:33.4; Autumn McGraw, Patten, 9:34.8; C. McNally, Patten, 9:35.4; B. Hartsgrove, Patten, 9:39.9; C. Pelletier, Plymouth, 9:40.1; Michelle Martin, Patten, 10:05.6; Mike Martin, Patten, 10:06.8; Brent Bailey, New Limerick, 10:32.8; K. McNally, Patten, 10:44.4; Joseph Pratt, Island Falls, 10:52.0; B. Rush, Stacyville, 10:53.5; Lisa Rush, Sherman, 10:58.9; Craig Hartsgrove, Patten, 11:02.8; H. Anderson, Crystal, 11:12.1; L. Anderson, Crystal, 11:17.1; Rachel McCarthy, Patten, 11:24.0; Penny Daggett, Patten, 11:37.5; A. Emery, Millinocket, 11:59.4; S. Boutaugh, Millinocket, 12:03.6; Shawn Boutaugh, Millinocket, 12:03.9; Kent Smallwood, Patten, 2:20.3; Helene Crabtree, Hersey, 12:25.7; Hilary Emery, Millinocket, 12:47.3; C. Powers, Benedicta, 12:59.0; Allison Atkinson, Stacyville, 13:03.2; E. Atkinson, Stacyville, 13:07.3; M. Jacob, Patten, 13:12.4; B. Atkinson, Stacyville, 13:15.5 and A. Rodgerson, Patten, 13:28.7. Also, Sue Miller, Patten 17:30.9; Clint Guiggey, Patten, 17:31.0; Maria Patterson, Sullivan, 17:32.4; Alicia Rodgerson, Patten, 17:33.1; Andrea Cutler, Veazie, 17:33.2; Isaac Quint, Linneus, 17:33.6; Lorna Harris, Patten, 17:34.8; Victoria Hanson, Linneus, 17:35.0; Andrew Anderson, Crystal, 17:35.5; Krystal Powers, Benedicta, 17:36.0; Belinda Desmond, Crystal, 17:39.3; Virginia Hartin, Island Falls, 17:40.6; Steve Hartin, Island Falls, 17:42.8; Mindy Libby, Island Falls, 17:45.0; Teri Peterson, Millinocket, 18:02.1; Michael Peterson, Millinocket, 18:05.2; Misty Violette, Island Falls, 18:14.9; Geni Montpetit, Castle Hill, 18:36.0; E. Flannery, Island Falls, 18:55.4; Theresa Schmidt, Patten, 19:08.9; Christe Crouse, Patten, 19:13.4; Caitlyn Morin, Sherman, 19:27.4; Dylan Harris, Sherman, 19:28.0; Phillip Desmond, Crystal, 20:11.3; Dorothy Sullivan, Baileyville, 20:17.1; James Sullivan, Baileyville, 20:17.4; Jan Martin, Patten, 20:37.1; Sharon Sirois, Sherman, 20:43.7; Patsy Dyer, Hampden, 20:45.3; Rachel Boone, Patten, 20:49.9; Roger Boone, Stockton Springs, 20:53.9; Valerie Nightingale, Stockton Springs, 20:55.1; James Troutt, Sherman, 21:01.9; Lynn Merry, Sherman, 21:36.7; Rick Miller, Island Falls, 21:54.3; Whitey White, Atkinson, 22:15.9; Nancy White, Atkinson, 22:16.2; Scott Harris, Patten, 22:21.3; Monica Noyes, Island Falls, 29:47.6; and Elisha Blum-Evitts, Patten, 29:51.4. The Spc. 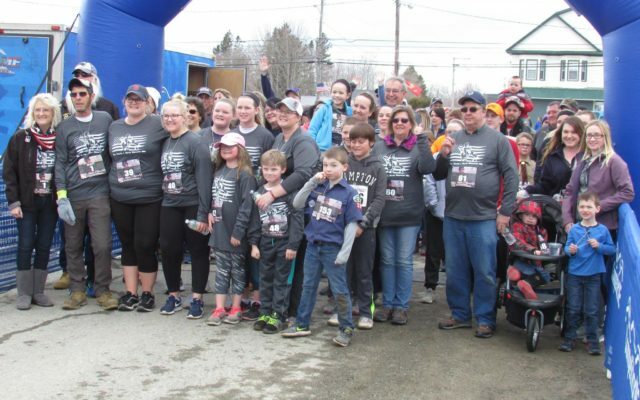 Dustin J. Harris Memorial Mile walk/run was held Saturday in downtown Patten, drawing a large crowd for the event.